Senator Antonio Trillanes IV is ever much confident that Rep. Gary Alejano will be elected as senator in the 2019 midterm elections. In fact, the soldier-turned politician he thinks that the Magdalo representative can get more votes than Presidential Communications Office (PCOO) Assistant Secretary Mocha Uson if both of them decide to run. “Yes, I’m completely sure that Rep. Alejano can easily win a Senate seat in 2019. This is why I fully support the Madalo group in their invitation to him to run.” Sen. Trillanes told reporters on Monday, April 9, when asked what the chances that Magdalo representative be elected, adding that they are in talks with the Liberal Party (LP). “The talks with LP has started and I am very optimistic that they will allow us to join the ‘resistance coalition.' Now, if you want to know on what I think his possible ranking in terms of number of votes, I cannot answer you. However, I can tell you that he can easily beat Mocha (Uson), ahead by at least 3 million votes.” The LP ally senator added. 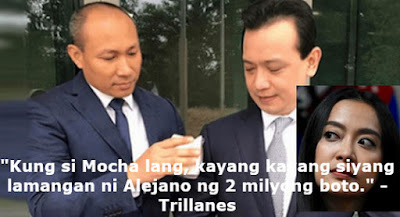 Last week, Trillanes confirmed that Madalo group is pushing Alejano to run for senator in 2019. But according to him, its executive committee is still in the process of consultation. He and Alejano played important roles in the so-called Oakwood mutiny on July 27, 2003, during the time of former President Gloria Macapagal-Arroyo. “The reason we are pushing Alejano to run for senator this 2019 is so that there will be someone to stand against the Duterte administration. Of course we believe he is very much qualified. He has principles and he is a war hero. His heart is in the right place, most importantly.” Trillanes, a former Navy officer, said at that time. As of posting, Mocha Uson has not yet comment on this latest tirade by Trillanes. Meanwhile, LP has not yet released their list of official senatorial candidates in 2019. Nevertheless, Sen. Bam Aquino is sure to run for reelection. Others names that could be in the list are former DILG Secretary Mar Roxas and Ifugao Rep. Teddy Baguilat.